Vietnam plays hosts to millions of tourists every year, yet the country still can feel like a well-kept secret, a place for quiet exploration and calm, depending on where travelers go. Whether visitors love the hustle and bustle of new cities or prefer quiet villages and seaside paradise, these resorts and hotels throughout Vietnam each offer travelers a chance to explore and relax. Amanoi Resort offers customized wellness experiences and a private beach that overlooks Vinh Hy, one of the most beautiful bays in Vietnam. The weather at Amanoi is often sunny without any clouds thanks to its unique microclimate. The Residences, Spa Houses, Villas, and Pavilions are a fusion of traditional Vietnamese architecture and contemporary elegance, situated on the coastal ridge with amazing sea views or nestled in the valley that overlooks a national park. Dining includes the Five Star Restaurant at the central pavilion with a menu that features fresh seafood from the bay and dishes highlighting Vietnamese ingredients. The Amiana Resort and Spa Nha Trang overlooks the waters of the beautiful Nha Trang Bay and is an award-winning, five star resort with more than 150 spacious villas and guest rooms boasting ocean or garden views, along with a private balcony. A natural seawater pool of 2,500 square meters, a 700-square-meter infinity freshwater pool, and a guest-only private lagoon beach with white soft sand are situated at the heart of the Amiana Resort. The resort has luxury built in to nearly every aspect and strives to provide a truly unique and private atmosphere and an escape from daily life. The Anantara Hoi An Resort features an enviable setting, located less than one kilometer from Hoi An’s historic quarter, in lush gardens along the Thu Bon River. The boutique luxury resort provides sunset river cruises from its own private jetty, blissful spa experiences, and riverfront dining. Guests can take a walk down the promenade past the charming small cafes and on into the quaint historic Ancient Town UNESCO World Heritage Site, exploring the teahouses, art galleries, shrines, and alleyways. Guest suites and rooms boast a natural outdoor-indoor flow, soft sunlight, and classic decor with views of the river or garden. The Angsana Lang Cô resort boasts that it welcomes guests to the heart of discovery and adventure, amidst the East Sea’s azure blue water and the Truong Son mountain range’s emerald green forests at Laguna Lang Cô. From the resort’s location, visitors can explore the three different UNESCO World Heritage Sites of My Son Sanctuary, The Imperial Citadel of Hue, and the Hoi An Ancient Town, just a relatively short distance away. Guests can also take part in a round of golf at the 18-hole championship course, various water sports, and even jungle hikes during their stay at the Angsana Lang Cô. The Banyan Tree Lang Co resort provides a sanctuary for visitors’ senses at the award-winning and beautiful resort in central Vietnam. The resorts is a private and relaxing paradise with all-pool villas situated Laguna Lang Cô between the mountain range of Truong Son and the East Vietnam Sea. The Banyan Tree Lang Co serves as a great destination for anyone looking for a luxury hideaway, as well as a base for explore the stunning area, including UNESCO Sites, such as My Son Sanctuary, Hoi An Ancient Town, and the Imperial Citadel of Hue. The resort is also home to six restaurants. 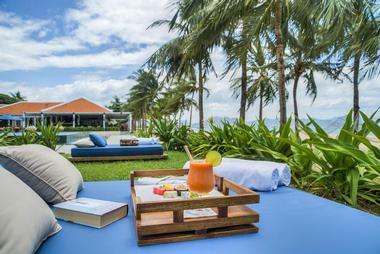 The Chen Sea Resort and Spa Phu Quoc is discreetly nestled within the secluded bay of Phu Quoc Island, offering a private and exclusive hideaway along the Ong Lang beach that overlooks the Gulf of Thailand. 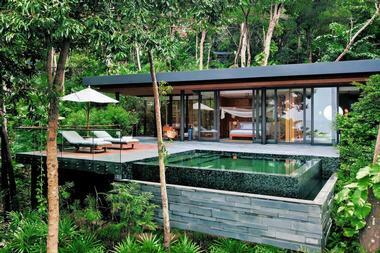 The area is surrounded by tropical, lush rainforest, giving off a tropical getaway atmosphere. The resort only contains thirty-six villas for guests, providing spacious accommodations, a private white sandy beach, and complete serenity and privacy. The Chen Sea Resort offers personalized service and natural beauty, striving to create a memorable and unique experiences for all guests with a resort fully integrated in the natural environment. Coco Beach Resort is a hotel which boasts that it does things a little differently than other hotels and resorts. From its beginnings, the beach resort believed that guests want to stay at a resort that lets them truly relax. None of the guests rooms at the Coco Beach Resort contain televisions and the resort does not offer 24-hour room service. The owners of the research believe that nobody really needs a meal at 3:00am or a television when people can sleep well with the sound of the waves. They offers a policy of respect, cleanliness, and friendliness. The Evason Ana Mandara resort in Nha Trang is the only beachfront resort in Nha Trang, situated between the road to the center of town and the bay. The resort is home to seventy-four guest rooms, a large number of which boast stunning views of the water and feature classic Vietnamese touches. Dining options at the Evason Ana Mandara include international, regional, and local cuisine made with some of the freshest ingredients available. 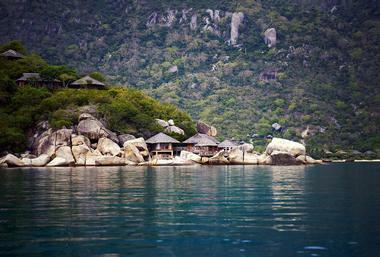 The Six Senses Spa offers specialty Vietnamese treatments, along with its signature spa menu. The resort offers a variety of excursions, water activity center, tennis, and more. The Fusion Maia Danang Resort provides a beautiful destination along the beach with an array of elegant private villas with pools, along with unique “breakfast anywhere, anytime” and “all-spa inclusive” services. The picturesque resorts is situated within an easy distance from several memorable cultural experiences, including UNESCO World Heritage Sites. 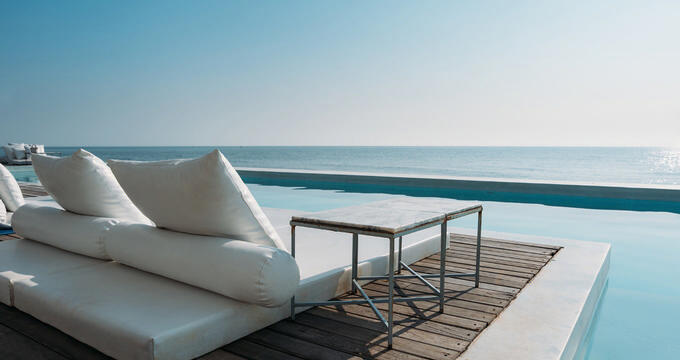 The Fusion Maia Danang Resort blends understated luxury with healthy living, aiming to foster more of a “way of life” than simply a destination resort. The resort emphasizes original concepts, sensibility, and wellness, which can be seen in every aspect of the resort, striving for relaxation for everyone. The Hanoi La Siesta Diamond hotel boasts a great location and a pleasant walk in the city of Hanoi’s Old Quarter, along with luxury amenities and facilities. Along with convenience of the hotel being situated near many restaurants, Hanoi La Siesta Diamond is only around a two-minute stroll from Hoan Kiem Lake. The hotel consists of forty luxury guest rooms and guest suites, most of which feature a window that opens, offering either views of the neighborhood or the street. Guests can easily explore both the French Quarter and the Old Quarter and see the noticeable contrast between them. 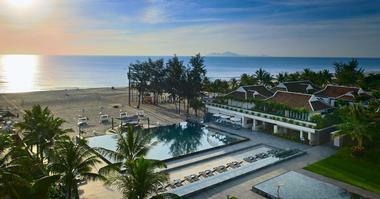 The Hyatt Regency Danang Resort and Spa is located along a serene stretch of a white sand beach in vibrant Danang, Vietnam. The resort serves as a great base for visitors to explore everything central Vietnam has to offer. The Hyatt Regency Danang Resort consists of almost two hundred guest suites and rooms, twenty-two three-bedroom villas, and 160 residences that range from one to three bedrooms. At least all of the villas features beautiful views of the sea. There five different pools at the resort, along with a fun water slide, and several places to graby a bite to eat. 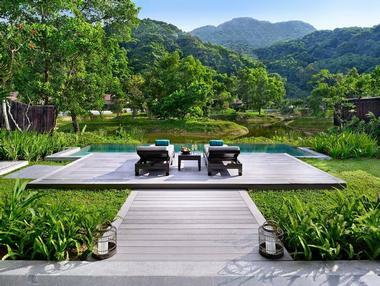 The InterContinental Danang Sun Peninsula Resort boasts an exquisite design created by the architect Bill Bensley, featuring a private beach and lush gardens. The traditional villages and temples of Vietnam served as the inspiration for the design of the resort. Guests can have a meal of classic French fare at La Maison 1888, sip a refreshing cocktail while taking in stunning views of the ocean, or relax with a soothing spa treatment. The InterContinental Danang Sun Peninsula Resort also offers yoga classes and guided treks throughout the surrounding area. Club InterContinental provides a wide range of extra amenities and benefits. The La Veranda Resort Phu Quoc is situated on Vietnam’s Phu Quoc Island and is a part of the McGallery collection of hotels and resorts, boasting a style similar to that of a mansion on a French seaside. The resort is nestled in a tropical garden along a beach and contains a boutique hotel, a spa, and a luxury resort with large terraces providing sweeping views. La Veranda Resort offers seventy guest rooms with their own private balconies, two restaurants, a day spa, water sports center, swimming pool, and a lounge bar across the stunning grounds on the beachfront. The Mango Bay Resort is situated on approximately ten hectares of land in front of the beach around ten kilometers to the north from Duong Dong, which is the main town on the island. The ethos of the resort is to provide guests with something closer to nature,a more unpretentious resort that is actually the opposite of luxury. Despite the Mango Bay Resort’s size, the grounds only consists of forty-four guest rooms and guest villas, each one unique and hidden away from everything. 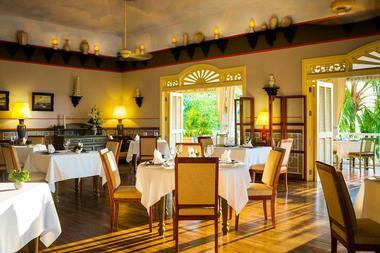 The main restaurant at the resort serves its own take on fusion cuisine. 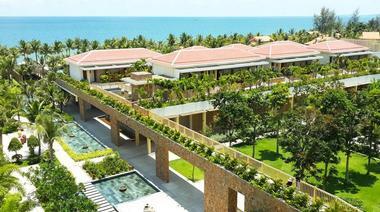 The Pandanus Resort first opened in 2004 and is located in Mui Ne, Phan Thiet. The resort is unique for several reasons. Pandanus is the only resort in the country that provides a complete all-inclusive program, live entertainment every day with two in-house bands, and daily complimentary wine and cheese welcome receptions. 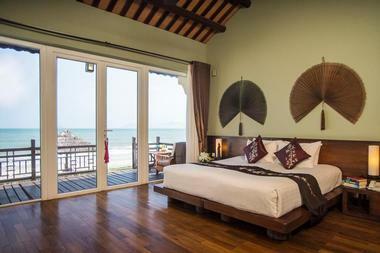 The resort also offers walking tours through Mui Ne, a historic fishing town. 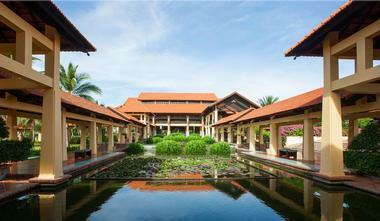 The landscape and buildings of the Pandanus Resort are designed to be a complement to the natural surroundings. A large free-form pool is located next to the beach and surrounds an island with palm trees. The Pullman Danang Beach Resort is located directly on the Danang Beach, only ten minutes away from the international airport and downtown Danang. 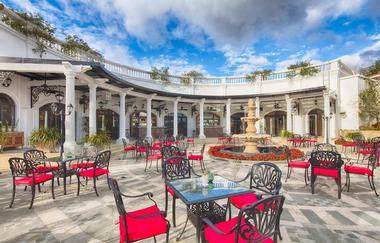 The resort is rather upscale and provides a variety of different amenities for both leisure and business travelers. The Pullman Danang Beach Resort is made up of almost two hundred spacious guest rooms and guest cottages with private balconies, bars and contemporary restaurants, seafront water sports, a spa, and an infinity pool. Each cottage on property has its own private garden as well. Families can take advantage of the MyKids package for fun activities for children. The Salinda Resort Phu Quoc Island is dedicated to providing all of its guests with excellent hospitality at the five-star boutique resort on Vietnam’s Phu Quoc Island. The resort boasts a prime location on the island with beautiful views and romantic sunsets. 121 luxury guest rooms, villas, and suites make up the luxury resort, all designed with a contemporary style with local touches that create a nearly seamless transition from the outside to the inside. All of this is surrounded by the simplicity and elegance of the natural environment of Phu Quoc Island, which is incorporated into the resort itself. The Silk Path Grand Resort and Spa Sapa sits on top of a picturesque hill that overlooks the grand Hoang Lien Son Mountain Range. The luxury resort is a great blend of vibrant local Sapa touches, French Indochina architecture, and local culture set amidst the charm of the northwest region of Vietnam. The Silk Path Grand Resort offers more than 150 guest rooms designed in the French colonial style with spectacular views of the picture-worthy rice terraces and beautiful mountains. 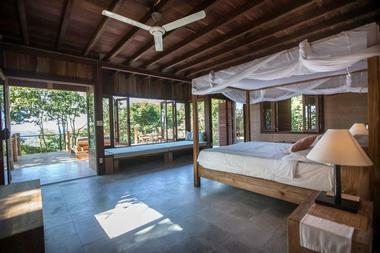 Each room has its own private balcony and luxurious bathroom, while some also have a spacious terrace. The Six Senses Krabey Island private resort combines the tropical landscape and a lush canopy of trees across its twelve hectares in a peaceful setting. The resort consists of forty free-standing pool villas, two unique restaurants, the extensive Six Senses Spa, a horizon lap pool, an ice cream parlor, a sky observatory, an open-air cinema, a beachfront sundeck, an oceanfront boardwalk, a sunset bar, and an outdoor fitness circuit. The Six Senses Krabey Island offers plenty of amenities and activities to keep guests busy and entertained. Krabey Island is about a 15-minute boat ride from the mainland jetty for the resort. The Six Senses Ninh Van Bay is a spa focused resort on a dramatic bay in Vietnam that aims to foster a feeling of an island and features impressive rock formations that overlook the East Vietnam Sea. The towering mountains and white sandy beach add a sense of being at one with the surrounding nature. Dining options at the Six Senses Ninh Van Bay offer both local and international favorites, as well as East/West fusion specialties. 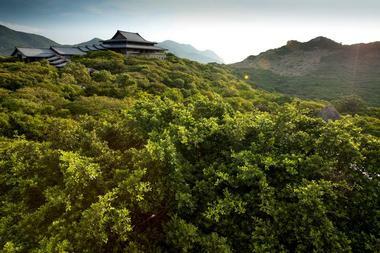 The Six Senses Spa offers traditional Vietnamese therapies and signature Six Senses treatments. Guests can enjoy drinks from the bar or the wine cave. Guests at the Sunrise Premium Resort Hoi An have the opportunity to take in stunning views of the sunset over the East Vietnam Sea, along with having a relaxing stay with the resort’s excellent service and luxury. The resort also offers a variety of culinary experiences that range from luxurious fine dining to the traditional cuisines of Hoi An. Asian fusion fine dining cuisine and traditional Vietnamese dishes are served at Spice Garden, while the Pool House serves daily dishes and fresh seafood. The Lounge at the Sunrise Premium Resort & Spa Hoi An is a contemporary bar and restaurant. The Victoria Hoi An Beach Resort and Spa offers visitors both outdoor and indoor dining at the L’Annam Restaurant, live music, a casual lounge, and a scenic bar on the beach. The Victoria Spa is spacious and provides massage treatments using an array of different techniques, including therapeutic, Thai, Balinese, and Vietnamese treatments. The design of the Victoria Hoi An Beach Resort and Spa is inspired by the Hoi An Ancient Town UNESCO World Heritage Site, beautifully incorporating Vietnamese, French, and Japanese elements. The resort also offers several benefits for guests who book directly, such as upgrades and bicycle usage. The Villa Song Saigon is a boutique luxury hotel situated along the Saigon River in Ho Chi Minh City and consists of twenty-three beautifully appointed, unique guest rooms and suites, boasting that “no two rooms are the same.” For dining options, guests can enjoy Asian culinary favorites that include Vietnamese dishes and modern cuisine that is paired with a carefully selected assortment of wines and other beverages at the all-day dining restaurant of Bistro Song Vie. This is combined with some great views of the river. The spa provides a range of services, from Aromatherapy to traditional Thai treatments.